A brand name has to sound good to begin with, but you can think up a meaning behind the word later on! This very principle was employed by many camera manufacturers when they came to creating brand names. Today, their brands are world famous. When modern-day consumers walk into shop looking for a new camera they are often overwhelmed by the sheer number and variety of brands on show: AGFA, Kodak, Canon, Konica, Leica. They are literally spoilt for choice. With their endless consultations on light sensitivity, sharpness threshold, white balance, and focal distance, both customer and sales-consultant fail to address one question: where did brands like GFA, Kodak, Canon, Konica, and Leica come from anyway? AGFA was founded in 1867 in Germany and takes its name from the German abbreviation of “Aktiengesellschaft fur Anilinfabrikation”. In truth, it was hard for the average German to pronounce such a complicated name, therefore in order to appeal more to the public and shorten the brand name it was decided to abbreviate it to the four letters AGFA. “But, why Anilinfabrikation (manufacture of aniline) when the company specialises in producing photography equipment?” you may ask. Yes, today the company is famous in the photography sphere, but before, when the firm was still a relatively unknown manufacturer, AGFA produced aniline and only began to make photography-related products at the end of the 19th Century. As they saw no sense in scrapping or renaming an already well-known brand, AGFA was retained. Canon, curiously enough, also began life outside the photography sphere – specialising in optical instruments. Way back in 1934 the Japanese company was still called Kwannon. Over time, the brand name Kwannon, originally taken from the name for the Buddhist goddess of mercy, was shortened. The W was dropped due to the fact it was a silent letter, and the second N also became redundant, and the initial hard K became anglicised to C.
Konica started out as Konishi Honten (Konishi Main Shop) – a Tokyo company specialising in camera production. That was back in 1882. By 1987 the enterprise had gone through several name changes (Cherry Hand Camera, Sakura Film, Baby Pearl, etc.) before becoming what we know today as Konica. 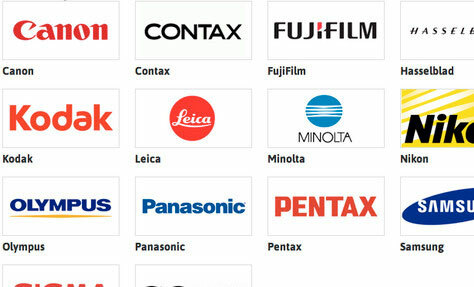 This final brand name is a combination of part of the old company name Konishi plus the first two letters of the English word camera (Koni+ca), thus making Konica. Leica originally made microscopes and other optical equipment back in 1849 when it still went by the grand and rather serious title of The Institute of Optics. The German firm began to be reinvented under the leadership of Ernst Leitz and started to focus more on the photography sphere. However, it did not make the full transition until 1924 when it first developed a prototype for its own camera with a 35mm focal distance. This new product required a new name. They settled on the brand name Leica – a shortened form of the company’s name (Leitz Camera). Kodak is also known by the name Eastman Kodak. The first word is the surname of the American company’s founding father George Eastman; the second was thought up by the owner of the enterprise. As it turns out, George, who was a legendary photography enthusiast as well as a successful engineer and businessman, simply liked the sound of the letter “K” and in 1888 he was set on thinking up a name which started with and ended in K. The middle “oda” part was added by Eastman as a filler just because it sounded right.